Product prices and availability are accurate as of 2019-03-31 04:17:55 EDT and are subject to change. Any price and availability information displayed on http://www.amazon.com/ at the time of purchase will apply to the purchase of this product. Decorate your house and drink in style with this Style in Print coaster set. This set of 4 coasters are made from a durable compressed wood material to endure daily use. These cork backed coasters are vibrantly colored, easy to clean and very durable. They are constructed of laminated hardboard with cork backing and are heat-resistant to 110 degrees C/230 degrees F. Cork backing provides a naturally non-slip grip for your hot or cool beverage. 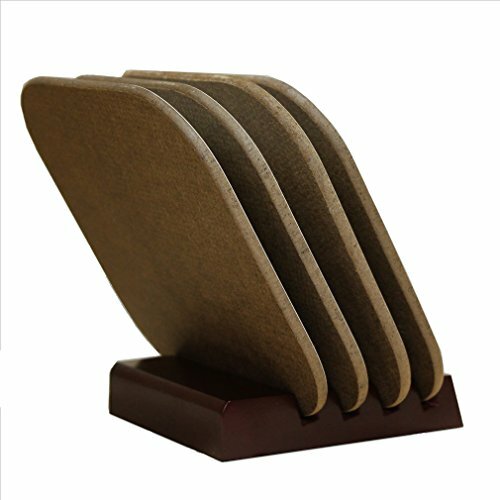 You can also buy these coasters with a mahogany stand to display them as decoration in your house.